As a high-flying raptor, the hawk shares much of the symbolism of the eagle. It is associated with light, royalty, power, the sun, watchfulness, and the heavens. Many solar gods have the hawk as an attribute or messenger. Gods portrayed in the form of hawks or as being hawk-headed are almost always sun gods. Like the eagle, the true hawk was thought capable of staring directly into the sun. The hawk has tremendous vision. Their eyesight is phenomenal and a key factor in their incredible hunting abilities. The hawk represents focused vision to keep our eyes (both physical & spiritual) keen on the areas that most require our attention. Specifically, the hawk beckons us to hone our focus on the areas that are out of balance in our lives. Recognition is the first step to solution. We derive the essence of power, energy and intensity just by visually appreciating the hawk. Consider its powerful beak and impressive talons. 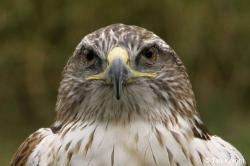 Its steely stare and intense focus also contribute to the aura of power the hawk holds. As such, the hawk asks us to be aware of the power each of us has over our own destiny and daily decisions. In dreams, a hawk represents our yearning for freedom and clarity and is often considered a message from the subconscious to use our intellectual power to obtain the freedom we desire in life. In ancient Egypt, the hawk was considered a royal bird and a symbol of the soul. Egyptians believed that the spirit of a mummy walked the earth, visiting the body from time to time, until eventually being reunited with the resurrected body. The Egyptian sphinx is sometimes hawk-headed. According to Egyptian mythology Isis, in the shape of a hawk, fluttered above the body of her dead husband while she conceived Horus (the son who would avenge his death). Almos, the founder of Hungary, was believed to have been sired by a hawk named Turel while his mother, Emese, was dreaming. In Greco-Roman mythology, the hawk is the 'swift messenger of Apollo,' and is associated with the sorceress, Circe. Aztecs also considered the hawk a messenger of the gods. Gayatri is the Hindu hawk who brought an intoxicating drink of immortality known as 'soma' from heaven. He is also a vehicle of Indra. Polynesians endowed the hawk with the powers of prophecy and healing. The Chinese associated this bird with war.